HRSA Administrator Dr. George Sigounas visited Health Care Center for the Homeless (HCCH) in Orlando, Florida last Wednesday for a listening session with staff and leadership – including (from left) CEO Bakari F. Burns; Rosalinda Jimenez, Dir., Oral Health Services; COO Chianta Lindsey; and Duane Wooden, Dir., Behavioral Health. Dr. Sigounas discussed the Administration's proposed Plan for America to reduce new HIV infections by 90 percent by 2030. 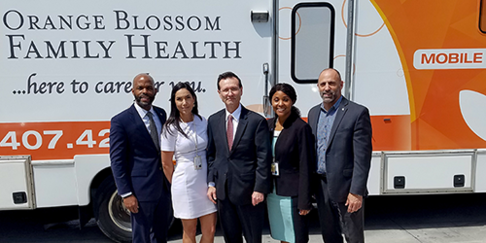 A division of Orange Blossom Family Health, the 25-year-old homeless center provides street outreach through a full-service mobile health unit, with integrated primary care, oral health services, behavioral health and substance use counseling in Orange, Osceola and Seminole counties in Central Florida. The health center was named a HRSA "Quality Leader" in 2018, receiving a $122,000 supplemental award for being in the top 30 percent for clinical quality measures (CQMs). The Health Resources and Services Administration's (HRSA) Federal Office of Rural Health Policy (FORHP) will be releasing a Notice of Funding Opportunity (NOFO) for a new Rural Communities Opioid Response Program (RCORP) initiative called RCORP-Medication-Assisted Treatment Expansion (HRSA-19-102). HRSA plans to invest approximately $8 million in rural communities as part of this funding opportunity. The funding opportunity will be posted at this link in the next few weeks. Successful RCORP-Medication-Assisted Treatment Expansion (MAT Expansion) award recipients will receive up to $725,000 for a three-year period of performance to establish or expand medication-assisted treatment (MAT) in eligible hospitals, health clinics, or tribal organizations located in high-risk rural communities. HRSA Administrator Dr. George Sigounas welcomed the "Friends of HRSA" on April 5. Representatives of the 175-member coalition of non-profit organizations met for two days of budget briefings and talks with senior agency leaders about programs pivotal to their constituents. Read more about the Friends of HRSA visit. The HRSA Health Center Program seeks public input on service area considerations that may inform decisions on expanding service areas through existing health centers adding new service delivery sites. The Health Center Program Service Area Considerations Request for Information (RFI) announcement will begin with a 30-day preview period. Following the preview period, we will accept public feedback for 60 days. Details about the feedback process will appear in a future Primary Health Care Digest newsletter. We look forward to your feedback. Eligible health profession students can receive payment for tuition, fees and other educational costs as well as a living stipend. In exchange, they serve at least two years at NHSC-approved sites in underserved rural, urban, and tribal communities. Applications are due May 9. Learn more about the NHSC Scholarship program. Eligible nursing students may receive funding for tuition, fees, and other educational costs as well as a living stipend. In exchange, they will serve at an eligible facility with a critical shortage of nurses upon graduation. We are accepting applications through May 21. Find out more about the Nurse Corps Scholarship Program. 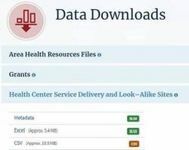 HRSA offers dozens of useful data sets on the data.HRSA.gov data download page. Available data include health centers, grants, shortage areas, National Health Service Corps, and more. Check out our data downloads. Known as Ayushman Bharat Yojna – or "Long Live India" – it has been called the world's largest healthcare program. It aims to provide greater access to healthcare by increased availability of services and affordability for low-income families. The program comprises two major initiatives: establishing 150,000 Health and Wellness Centers and the National Health Protection Mission, providing financial coverage to 100 million families, or approximately 500 million people. The delegation toured Unity Health Care – Washington D.C.'s famed community health center, a certified Patient-Centered Medical Home with over 20 clinical locations in the city and more than 100,000 patients – and met with staff from HRSA's Bureaus of Primary Health Care and Health Workforce, and Office of Global Health. Read more about HRSA's visit with the delegation from India. The YES Initiative is a new funding opportunity supporting projects that address the HHS priority to expand youth participation in sports and encourage regular physical activity, especially for youth populations with lower rates of sports participation and communities with limited access to athletic facilities or recreational areas. The new funding opportunity was jointly announced by the HHS Office of Minority Health and Office on Women’s Health, in collaboration with the Office of Disease Prevention and Health Promotion and in consultation with the Office of Adolescent Health and the Office of the President’s Council on Sports, Fitness, and Nutrition. Learn more about the funding opportunity and how to apply. "Everyone sees the numbers. On the ground level, I see the faces." – Angela Gray, Director of Public Health Nursing in Berkeley County, West Virginia. Years of health care shortages and a rapidly aging population – together with the sheer volume and pace of overdose emergency calls, ER admissions and hospitalizations – have coarsened many first responders, police and whole communities, she said in a National Public Health Week presentation at HRSA headquarters. HRSA has invested more than $400 million in the state since 2015 – including some $9.4 million in health workforce training and development awards last year alone. West Virginia grantees also received $8.2 million in opioid response funding in 2018. Read more about the effect of opioids on the health workforce. The National Quality Initiative (NQI) is accepting applications to participate in a 12-month Collaborative Improvement and Innovation Network (CoIIN) focused on improving students’ health and mental health in school-based settings. The application deadline is Friday, May 31 at 11:59 p.m. ET. The National Quality Initiative (NQI) is funded by the HRSA's Maternal and Child Health Bureau, and is part of the Bureau’s CoIIN program, which uses evidence-based strategies to improve the health of America’s mothers, children and families. Learn more about the opportunity and how to apply .